150 6. 2 Taxation, Economic Growth and Deadweight Loss 152 a. Introduction 152 b. The Tax/GOP Ratio and Economic Growth 155 The Tax Mix and Economic Growth 6. 3 177 6. 4 Taxation and Employment 181 a. Introduction 181 b. Unemployment: An DECO -Wide Problem 184 c. Current Explanations are Unsatisfactory 186 d. Objectives and Methodology 188 e. Labour Force Participation Responses to Tax Changes 188 f. Employment Growth Responses to Tax Changes 189 g. Unemployment Rate Responses to Tax Changes 190 h. Tax Mix Changes and Employment Effects 190 i. Deadweight Loss in Labour Markets 191 j. Conclusions 192 7. REVIEW AND ASSESSMENT OF THE HEALTH OF NEW ZEALAND'S TAX SYSTEM 7. 1 Introduction 195 Measuring the "Health" of the Tax System 7. 2 195 7. 3 Key Findings on the Total Tax level and Tax Mix 196 7. 4 Key Findings on the Hidden Economy and Tax Evasion 210 7. 5 Sources of Tax Evasion 214 7. 6 Tax Evasion Responses to Tax Changes 216 Trends in Corporate Tax Payments 219 7. 7 7. 8 Key Findings on Economic Growth and Employment 224 7. 9 'Best Practice' Tax Policy Frontiers and their Implications 229 Summary Scorecard: Economic, Compliance and Revenue Health of 7. 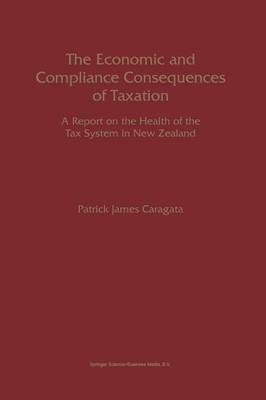 10 the Tax System in New Zealand 231 Appendices Working Papers on Monitoring the Health of the Tax System 1. 234 2.